February 9th 2005. Chinese New Year - the Year of the Rooster. Note: The scan does not properly show the Chinese characters, 2005 and "Year of the Rooster"
Asian folklore says that people born in the Year of the Rooster can be a bit eccentric, but are deep thinkers and often very talented. They like to be busy and show disappointment if they fail. They often have problems with relationships as they are frequently loners. Although they give the outward impression of being adventurous, they are often timid. Their emotions, like their fortunes, fluctuate between very high and very low. They can be selfish and a little outspoken, but are always interesting. 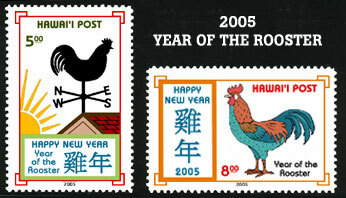 Two stamps were issued on February 9th 2005 to celebrate the Year of the Rooster. The $5 stamp (above left) prepays the Overnight rate. It shows the head of a rooster on a weather vane. Note the image above does not properly show the metallic cyan color of the Chinese characters. "Happy New Year" and "Year of the Rooster". The $8 stamp (above right) prepays the Same Day rate. It shows a colorful rooster. 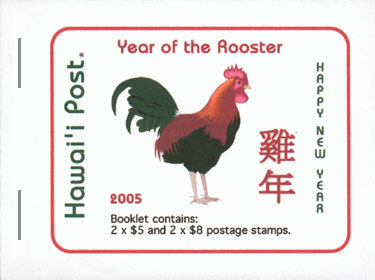 Note the image above does not properly show the metallic cyan color of the Chinese characters, 2005 and "Happy New Year". A Booklet consisting of 2 panes containing 2 x $5 and 2 x $8 stamps was also issued. Each pane consists of 2 stamps and has a white margin all around. "© 2005 Hawai'i Post" is printed vertically on the lower right side margin & Hawai'i Security Printers, Honolulu, Hawai'i. is printed on the bottom margin of each pane. Colors: $5 & $8 - Multicolored and Metallic Cyan. Printing Method: 4-color (Cyan, Magenta, Yellow and Black) printing process, with Metallic Cyan spot color added.